Three lumber flats equipped with wood racks wrecked in the McCloud yard. From the T.E. "Eddy" Glover collection. Wood is plentiful along the McCloud River, and the railroad and lumber companies used it as the principle fuel in steam powered logging and railroad equipment through the early years. Wood remained popular as a fuel in heating and cooking stoves after most of the industrial equipment changed over to burning oil. Throughout most of its history, the railroad played a central role in transporting wood fuel, both for its own purposes and for those of others, including the lumber company and the employees of both companies. 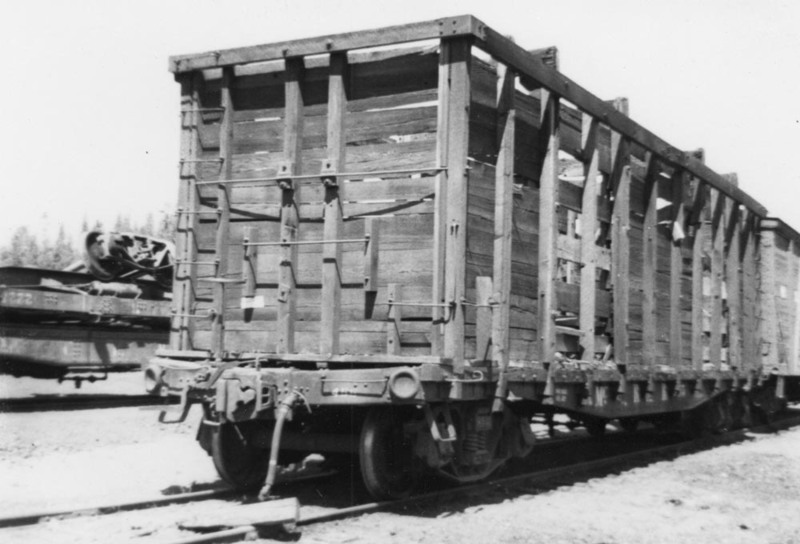 At first, wood chunks and pieces would be loaded directly onto flatcars; however, the railroad started equipping flatcars- mostly borrowed from the lumber and log flat fleets- with racks to contain wood to the cars. In later years, the railroad rostered flatcars dedicated to firewood service. 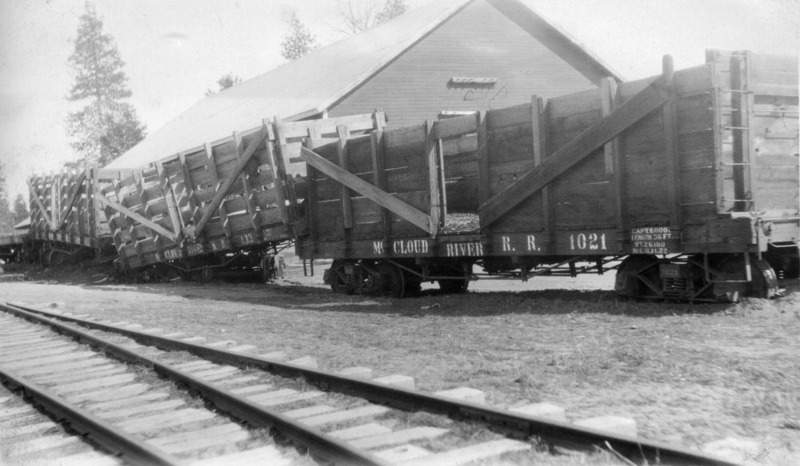 It was not uncommon for citizens in McCloud to buy firewood from the lumber company on a carload basis; in such cases, the lumber company would load the wood rack flats with various ends, pieces, and other waste products, and then the railroad would spot the cars at the bottom end of the McCloud yard for unloading. 455, 457, 459: 40-foot, 50-ton capacity steel frame flatcars, purchased 1939 and equipped immediately with wood racks. #455 likely converted circa 1950 to log flat #2987; #457 and #459 retired by 1969. Wood rack flat #455 in the McCloud yard in 1940/1941. This car spent most of its time in this service in Pondosa shuttling wood ends and scraps between the Ben Cheney sawmill and the lumber company cookhouse. Jeff Moore collection. 461, 463: 40-foot, 50-ton capacity steel frame flatcars, purchased 1940 and equipped with wood racks. #461 converted 1950 to log flat #2985; #463 retired by 1969. 465, 467: 40-foot, 50- ton capacity steel frame flatcars. Converted 1944 from log flats #2689 and #2837. Retired by 1969.